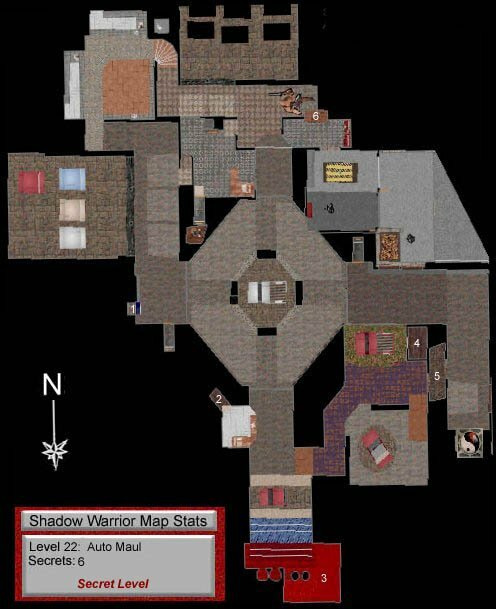 This is one of the two secret levels hidden within Shadow Warrior. Your objective is to find the four key cards needed to complete this level and continue onward. 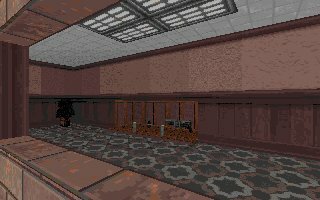 You start this level just inside of a hallway. 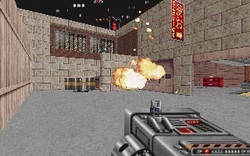 Straight ahead of you are explosive barrels and enemies behind them taking shots at you. Shot the barrels and the explosion will kill the enemies. 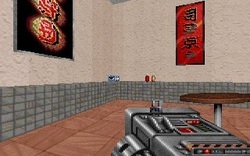 As you walk forward into the hallway, Enemies will be taking shots at you from the left. There are also barrels there you can shoot. A portable medkit is hidden inside one of these barrels and will be ejected toward you when the barrel explodes. Next, walk forward into the cafeteria. When you turn into the cafeteria itself, enemies will be firing upon you. Clear this room out and you will find a blue key card in the northwest corner of the cafeteria. Be sure to grab the fortune cookie near the register of the oriental food stand and any other items in the rest of this room. Picture: The blue card is in the cafeteria. As you walk north out of the cafeteria, more enemies behind barrels will be shooting at you. Shot the barrels and kill the enemies near them at the same time. As you walk into this next area, watch for more enemies, especially elusive coolie ghosts. When you get to the end of this hallway, you'll come to a steel curtain which leads to a hub with a silver truck in the center and three other curtains leading different directions. Be aware of enemies inside this hub as you enter it. The truck in the center of the hub has an Uzi and a Railgun in the bed. The curtain to the right of the one you just entered requires the blue key card you just retrieved. Open the curtain and then walk backwards a few steps. Shoot all the enemies in sight and then slowly walk back up to the curtain and shoot the enemies to your right. Once this area has been cleared, walk to the office area to the right and grab the Missile Launcher and Uzi clips. Behind the red show car, there are also shotgun shells and a medkit. Picture: A sales girl shows off the convertible with a red card on its hood. As you continue forward into the next area, again watch for attacks and enter cautiously. 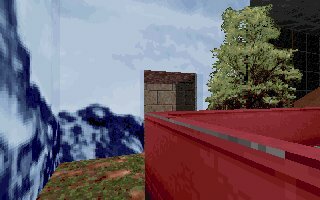 The next vehicle you come across is a red truck which has a case of Sticky Bombs in the bed. 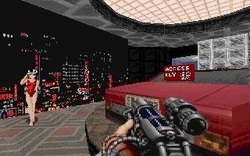 Continue walking up the ramp when you reach the end of this hall and you'll see a red convertible with a Riot Gun in the backseat and the red key card on the hood. Grab the items you need and go back to the hub. Go straight across to the south curtain that has a service sign to the right of it. 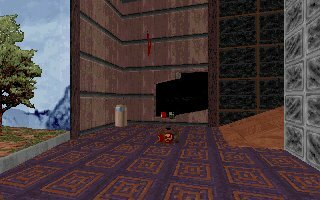 Open this curtain and fight off the enemies there and walk to the red key card door. Use your key card, open the door, and walk into the service waiting room. Shoot the window out between the waiting room and the service garage and jump inside. Watch out for enemies on the raised platform. Once this room is clear, jump on the workbench and then onto the platform and grab the items there. Now drop back down on the floor and activate the switch on the south side. The garage door will open into a yard and enemies will be there. Shoot the barrels killing the enemies and then walk north to the dumpster. Picture: Shoot the exploding barrels and kill the hiding enemies. Jump into the dumpster. On the short wall to the south there is an armor suit. On the north side there are two windows. Jump onto the window ledge and then over to the far window and jump into it. Stay on top of the ledge up high and shoot any enemies from this position. Now turn to your right facing east and you can see the yellow key card on the ledge corner. When you reach the key card, you can also see a vent grating close by. Shoot the grating and jump inside and grab a Ripper Heart. Now jump onto the floor and walk up the ramp and down the hallway. You can see the exit there, but it requires the green key card to enter inside the steel barrier blocking it. The curtain on the other side of this hallway also requires the green key card, so jump back into the window you entered this room from and make your way back through the service garage to the hub again. 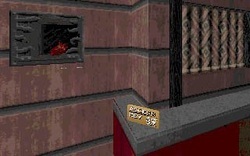 Picture: The yellow key card sits up on the corner of the ledge. Once you are in the hub, walk to the east curtain that is to your right. Walk into this hallway and stay to the right where you can see a yellow key card slot. Walk into this alcove and use the key card and open the door ahead of you. Fight off all attacks and you'll see the green key card in the corner of the desk. There is also a medkit on top of the file cabinets and a vent grate above it that hold a Riot Gun inside. If you shoot the computer case on the desk, you can also get a RAM heat seeker card inside. Picture: green key card and a RAM heat seeker card are on the desk. Now go back out the same door you entered and make your way back to the hub again. The green key card curtain is straight across to the west. Use your card and open the curtain. Prepare for attacking enemies. Once they are cleared, slowly make your way up the ramp. As you approach the top, a Sumo boss will be there ready to stop you. Act quickly and run back down to the hub and use the pillars there to guard yourself from his attacks and fire upon him when you have openings. When you have defeated him, go back up the ramp, open the barrier and exit the level. 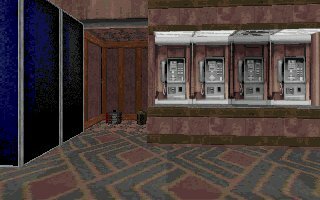 1) After you get the blue key card from the cafeteria, and blow up the barrels in the hallway to the north, you'll notice 4 phone booths and a soda pop machine next to the phones at the end of the hall. If you look at the phones, you'll see that one of them has a light above it broken out. Use this phone and the pop machine will swing out revealing a secret area with some missiles and a gas bomb inside. 2) Just inside the curtain that is unlocked by the blue access card, there is a small office area over to the right. Go up to the computer and use the keyboard and the file cabinet in the corner will lower for a short time revealing a little nook with some caltrops and a portable medkit. 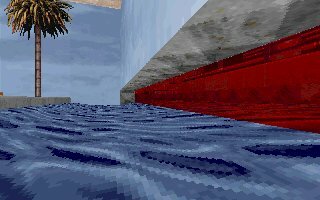 3) Just past the second secret area, there is a red van with a palm tree in the corner. There is water behind the van. If you dive down into the water, there is a secret area to the north. There is also a Baby Ripper in there so prepare for its attacks. Inside you'll find armor, Uzi clips and a flash bomb. 4) As you continue around through the show room, the next vehicle you come to is a red truck. At the rear of the truck, against the wall near the tree, you can see that the wall is slightly discolored next to the tree. Push on the wall and another secret area is exposed. Inside are shotgun shells, a smoke bomb and missiles. 5) Right after the last secret area, you'll notice a crack in the wall just before the ramp that leads to the red convertible. Blow up the crack and a nuclear missile will fly out and an opening will expose a gas bomb and a medkit. 6) The next secret is found in the service department behind the red access curtain. Break the glass between the waiting room and the service stalls and jump through the window and up to the car on top of the hydraulic service rack. You will see a wall switch in the corner as you walk towards the wall. Flip the switch twice until the lights go off in the service garage. Now jump back through the window into the waiting room and flip the wall switch off in here. 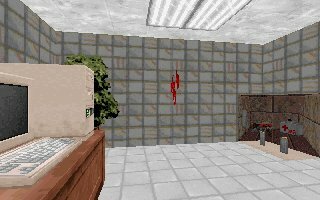 The bookcase against the wall will lower exposing a hidden area with a Grenade Launcher, a couple Uzi clips and a flash bomb.